Here it is Friday again! This week our recipe is for Provençal Vegetable Soup. Recently, we had a few days that were cooler than normal, with low humidity. Not today! The temps have gone back up, and so has the humidity. I started my soup early in the day, and planned on just heating it up for dinner. While I was chopping and preparing my veggies, my husband walked in and asked, “Why are you making soup…it’s 85 degrees out? Don’t you have something to grill?” Silly husband, it’s for French Fridays! This soup is full of fresh veggies and garden fresh flavor. A taste of summer in a bowl! I picked up all the veggies at my local farm stand. Unfortunately, none of the veggies I’m growing are ready yet. We're having such a late season. I did get two yellow grape tomatoes this week. Soon, I should be bombarded with more than I know what to do with. However, for now I will be happy picking fresh herbs off my deck. This soup uses canned broth or water, which makes it simple and fast to prepare. Even in the heat of summer! Once everything is chopped, start sautéing the onion and garlic in heated oil, until soft. Add the broth and herbs, and bring to a boil. Reduce heat and simmer. Add the carrots and potato, and cook about 10 minutes. Add the beans and zucchini, and cook for an additional 10 minutes. This soup comes together fast and was ready to serve with a drizzle of pesto, in less than an hour. I really enjoyed this dish….a perfectly delicious summer vegetable soup! The pesto was a wonderful addition. Now for the bad news…Bill did not like it! But that should not be a surprise…he doesn’t do veggies he can see! I say more for me! Enjoy, but wait for a cool day! On a different note, I spent last weekend in NYC with three of my Dorista friends. For me it seems incredible how quickly we felt comfortable with each other. Like old friends! We all took trains in from our respective areas. Me from NJ, Cher from NY State, Betsy came down from Boston and met Diane in NY, and they took the train together into the city. We enjoyed some lovely meals, but none as fabulous as the one we ate Friday night at La Grenouille. According to a NY Times article…La Grenouille is well into its fifth decade, and is still giving lessons in how an elegant French restaurant should be run. The scale is intimate, the floral arrangements spectacular, the cooking classic. This was a perfect choice for a Dorista meet-up! Thank you, Diane for a great choice! 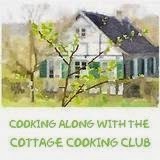 After four years of cooking through Dories cookbook, "Around My French Table", we have cooked or baked many of the selections that were offered. It was fun to have a four-course meal, served so elegantly over several hours time. 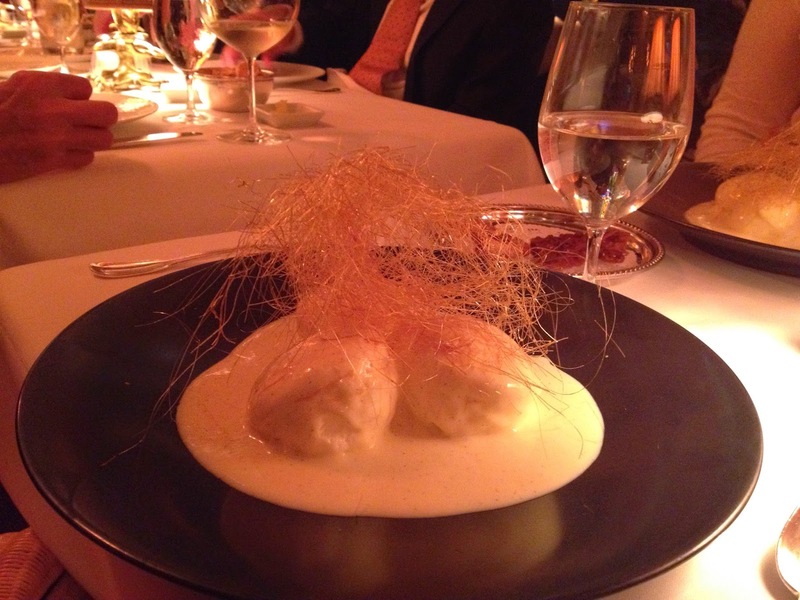 Floating Islands at La Grenouille…remember those? The next day was spent at Chelsea Market, picking up some hard to find items and some special treats to bring home. 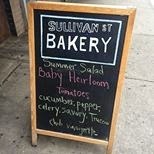 We took a wrong turn and happened to walk right by Sullivan St. Bakery. Of course, we went in and bought ourselves some bread. 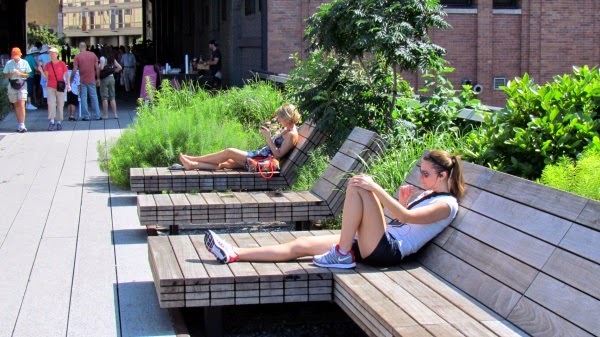 When we left Chelsea Market, we walked through the meat-packing district and had a lovely garden lunch. After we re-energized, we walked the HighLine. 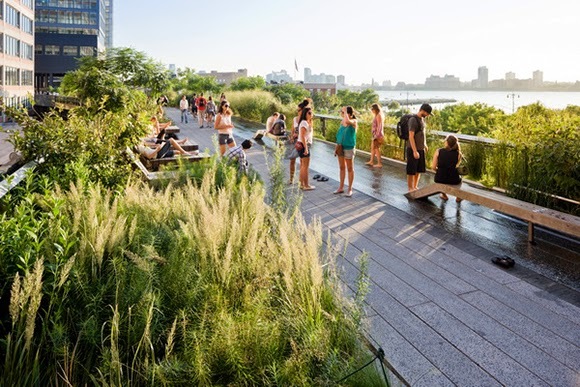 The High Line is a 1½ mile New York City linear park built on a 1.45-mile section of the elevated former New York Central Railroad spur called the West Side Line, which runs along the lower west side of Manhattan. 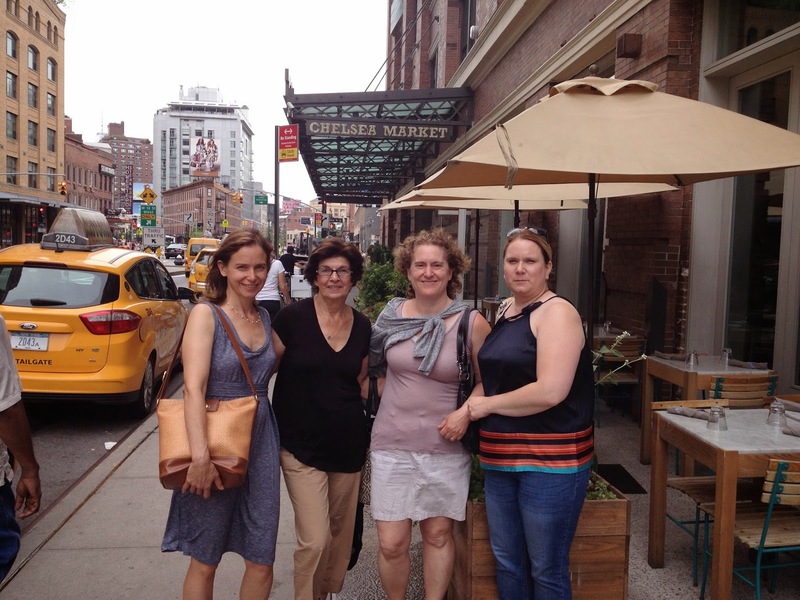 The girls at Chelsea Market…a fun day! When we finally got back to the hotel we were all quite tired. However, after a little rest we were dressed and out for dinner again. This time Italian! A very nice restaurant with outdoor dining, called Bistro Milano. The next morning we all had breakfast together and headed home. As the train pulled out of Penn Station I was thinking about the great time we had, and how wonderful it is when virtual friends become the real thing! Happy Friday everyone! You can find this recipe in Dorie Greenspans cookbook, “Around My French Table” or here where it has been posted. This soup was all mine too as DH was away for a week! What a lovely time you ladies had, thanks for sharing! Love Hard Line and all the places you featured in your post. A great picture of the Dorista ladies too! It was a little hot for soup this week, but we must do what we must do! I loved the flavors too. I'm still smiling about our Dorista weekend, so nice to revisit with the photos. Like you, I find it amazing how quickly it felt like we were among old friends. Thanks for making the weekend happen! Happy Friday! Such a fun meetup :) Hopefully there will be more soon! And I kind of liked that I had so many leftovers of this soup too (I'm on my own in Paris right now) - I LOVE this type of food! That's a beautiful photo of you ladies! The soup looks healthy and very tasty, Kathy. It's so wonderful how we have all come to be real friends! Your 4th photo looks like you took it at Provencal cafe! We loved this, too. Glad you all had fun! Bummer it got so hot in NJ , it stayed nice in NY. We were lucky the weather was really pretty cool for NYC in July. It truly was special to finally meet you, Betsy and Cher. It really never felt like we didn't know each other. I really loved La Grenouille too, the food, the flowers and lets not forget the folks dining on either side of us. Cheers... to birthday wishes coming true. How could I have forgotten the Birthday girl! Hoping she got just what she wanted! I have a feeling she figured it all out :-) Our dining companions were interesting weren't they? It made the meal even more of an experience! and fortunately the weather cooled enough to enjoy it all. I love this dish Kathy and love the pics too! Sounds how you had a lovely and fun time! Amazing! Well to start, your soup looks wonderful. I thought it was delicious too! And then your trip and lovely time with the girls! What a great trip, action packed and full of fun. I'm super jealous! But so happy that you were able to get together. Thanks for sharing your adventure! love your photos! your styling always blows me out of the water!! : ) looks like you had a lovely visit too!! hope you get a chance to make the soup again this summer, maybe Bill can figure out how to grill it ... LOL! I knew it would be a wonderful week-end and am so happy you shared it through your Post. Your dinner at La Grenouille had to be more wonderful because you all have almost cooked through Dorie's marvelous cookbook. I suspect you all could visualize the memories of "your" attempts on FFWD as you were reading through a "very familiar" menu. How many times did you say, "Do you remember when we made this.....and on and on. It's amazing that all our virtual friends are even better in reality, isn't it? Your soup looks wonderful Kathy, and you are right - more for you if Bill doesn't like it. Thanks for posting some photos from your Dorista catchup - I love getting a peek at my fellow Doristas and what they are doing on the other side of the world. I was just talking with Tim last night about going to Chelsea Market in NYC next year, so this is providence. If you come to NY maybe several of us could meet you in the city! I loved looking at your photos this week - both of the soup and of your NYC weekend. I'm glad you enjoyed the soup, even if Bill didn't. It's so hard for me to imagine not liking vegetables. I love that soup. We both love veggies and it would be well-loved by us both. I'm envious of your visit with the Doristas! What a fun Dorista get-together! I wish I lived closer to New York... Your soup looks so delicious! We loved it too (I'm lucky that my husband is a veggie-lover, so he had no problem with the soup, except for the zucchini). The weather has been pretty much the same here until today! Boy oh boy, I know it's probably me but it actually feels chilly outside with NO humidity! Suppose to be that way all week. I kinda wish we were going into the city this week because it's so cool but we won't be going until August 10th. It will probably be hot and humid, again! Your soup is perfect for this week though. I'm going to the out door market tomorrow. Hopefully it will be brimming with freshness but as you say, the season is late this year. My Joe would not have been on board with this one either - so I fed it to the girls and sent a jar of it over to my parents. I knew they would like it! Your pictures of it are bright and colorful - definitely in alignment with summer. Your New York trip looks like it was so much fun - what great company, too! I'm so sorry you had to make soup in such hot weather, I just couldn't resist picking something that was full of summer vegetables. Yours looks so good. I finally posted about this soup and it's made me think that with all the pesto I've got in the freezer, there's a winter version in there, too.